A deal has been reached over fishing quotas in EU waters, with increases for North Sea cod, haddock and monkfish. Following negotiations in Brussels, member states agreed limits on 53 stocks. Two thirds of fish in the North Sea and Atlantic fisheries will be subject to sustainable catch limits next year. 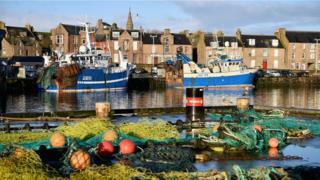 The UK government welcomed the deal while the Scottish Fishermen's Federation said it was waiting to study the detail. The negotiations are likely to be some of the last before Britain leaves the EU and the Common Fisheries Policy. The Department for Environment, Food and Rural Affairs (Defra) said the deal would give UK boats fishing opportunities worth more than £750m in total. North Sea: cod +10%, haddock +23% and monkfish +20%. Irish Sea: cod +377% and haddock +55%. Stocks of both cod and haddock are now accredited as sustainable by the Marine Stewardship Council. Challenges remain in some areas, however, with tight limits imposed in the Celtic Sea to allow the recovery of haddock and megrim. Catches for Atlantic mackerel will also see a significant restriction. Scotland's rural economy secretary, Fergus Ewing, said negotiations had been challenging but the outcome was "broadly fair". He told the BBC's Good Morning Scotland programme: "We have secured a strong result for Scotland's fishermen, with deals worth more than £440m to the industry and crucial increases from many of our key species. "So overall we achieved a great number of our objectives, but there were some disappointments. In the west coast, we fought very hard to get an increase for our prawn fishermen and we were disappointed we didn't secure a lower reduction in the quota for that particular species." Mr Ewing said that Brexit had "loomed large" over this year's negotiations. He added: "Now that these deals have been confirmed, we will continue to seek real assurances from the UK government that they will not trade access to Scottish waters away to secure other interests in the Brexit negotiations. "We cannot and will not accept Scottish fishing interests being put at risk." Mike Park, chief executive of the Scottish White Fish Producers' Association, described the deal as broadly fair, with some notable disappointments on the west of Scotland. However, he raised concerns about the "hardline" attitude of other countries and the EU Commission as Britain prepares for Brexit. "If this was a prelude for the final round of fisheries negotiations next year before the UK leaves the European Union, it does not bode well," he said. "The other countries are going to have to come to the table with their sensible hats on, rather than insisting that the UK will not get a kilo of the fish that it is legally entitled to take control of outside the CFP." Bertie Armstrong, chief executive of the Scottish Fishermen's Federation (SFF), said he believed there were signs that countries across Europe were adopting "very entrenched views" ahead of Britain's EU departure. He said: "Looking to the future, international law is abundantly clear that upon exit, control over the UK exclusive economic zone will revert to the UK governments. "That will allow the UK to decide for our own waters who gets to catch what, where and when. But it doesn't mean we won't be willing to negotiate access. The difference is that it will be on our terms." Shetland Fishermen's Association chairman Leslie Tait said the deal was "fairly positive" for the whitefish fleet but criticised an "absurd" cut in the mackerel quota. He added: "We are sick and tired of the political horse-trading over fishing opportunities that goes on every year. "This has nothing to do with proper fisheries management. We need to get out of the Common Fisheries Policy on Brexit Day One and start making sensible decisions as soon as we can."